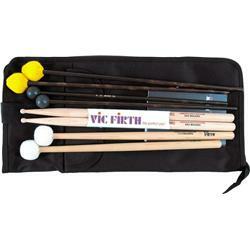 The EP2 contains a Vic Firth stick bag, equipped with a pair of SD2 Bolero American Custom Drumsticks, M3 medium Vibraphone/Marimba Mallets, M6 Bell & Xylophone Mallets and T3 Staccato timpani mallets. M3 American Custom Vibraphone/Marimba Mallets This medium hard yarn wool mushroom head mallet for all-around playing works well for Vibraphone or Marimba. They have black birch shafts for rigidity and consistency. M6 American Custom Bell & Xylophone Mallets The M6's have 1" phenolic ball ends and are great for all around playing on bells and xylophone. They have black birch shafts for rigidity and consistency. T3 Staccato American Custom Timpani Mallets Turned from a single piece of rock maple, which eliminates a core that could rattle and the need for a screw-on washer to secure the head. Coupled with round seamless heads, they produce bigger and brighter sounds. The T3's are medium hard for rhythmic articulation. Length = 14 1/2", Head Size = 1 1/4".